The SouthWest Ohio DX Association has announced that Ruth Willet, KM4LAO, will keynote its 32nd annual DX Dinner, held in conjunction with the 2017 Dayton Hamvention®. Her topic will be "Experiencing the Hobby of a Lifetime." RUTH is a freshman at Kettering University in Michigan, majoring in mechanical engineering and engineering physics. As a member of the 2016 Dave Kalter Memorial Youth DX adventure, she travelled to the island of Saba. The callsign PJ6Ywas on the air from August 2-9, 2016. ( team website is http://www.qsl.net/n6jrl/ ) There were nine in the group and they lived on the island for about a week. It was a lot of fun, getting the experience of travelling there and operating from the island. They operated on satellites which most had not experienced before, as well as HF. Getting to put Saba on the air was quite the adventure. On the 22nd March 2003, seven founding members got together on air and the AWA of Southern Africa was breathed into life. Since then, there have been 10 presidents from around the country and membership has grown to 274, with members from 10 different countries around the world. Saturday morning SSB nets, CW and AM nets, Newsletters, CW open days, Valve QSO parties have all become part and parcel of the organization and has made quite a mark in the Amateur Radio development and heritage of radio in Southern Africa. The best of all and one of the trade marks of the AWA is that Membership is free and by association. This was the cornerstone of the founding. Thanks to the members who have donated radios , money and time to raise money, we have not only survived, but thrived. Whether you are a new member or a founding member, we salute you and thank you for wanting to be part of this organization. Exchange: Call sign, RS, consecutive serial numbers, plus type of radio used, e.g. HT37 TX. I am Yukiko Maki 7K4TKB in Tokyo, Japan, the DX Chairperson of Japan Ladies Radio Society (JLRS). I would like to make an announcement that our club JLRS celebrates the 60th anniversary of foundation (1957) of the club this year. To celebrate our anniversary year, we launched the special station 8N60JLRS on April 1 2017 and will operate it until March 31, 2018 (for one full year). We take turns operating each month from different call areas in Japan starting from 6 call area, Kushu islands, in April, and operate in any bands and any modes. We hope to make as many QSOs as possible during this special anniversary year. Celebrated annually on 17 May, marking the founding anniversary of the International Telecommunications Union (ITU) which was initiated in 1865 and first celebrated in 1969. World Telecommunications Day is celebrated to increase awareness of communication technology among the public. It aims to make information and communication more accessible to people in remote, rural areas. The day is celebrated with a different theme every year. Guinea-Bissau - Rubane Island (Bijagos Arch), Dxpedition J5B & J5W AF-020 - Nuria Font Soler (YL station EA3WL) has been on another exotic dxpedition, go to her Facebook page to see some great photographs of Bubaque, Bolama and Rubane island in Bijagos Archipelago and their people. After 7 days of operating in the Bijagos Archipelago, 7 to 15 April 2017, J5B (Josep EA3BT) & J5W (Nuria EA3WL - YL) have 19,500 QSO's in the log! The last operation from this reference was in 2010, more than 7 years ago. They are very happy except they no longer have any voices and have returned home to ponder their next dxpedition. 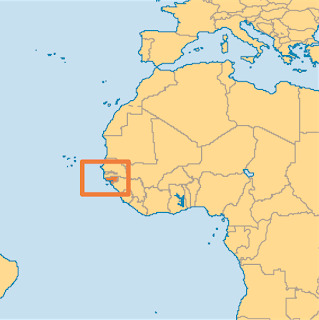 The Bijagós Arquipélago, (11°14’N - 16°02’W) are a group of about 88 islands and islets located in the Atlantic Ocean off the coast of the African nation of Guinea-Bissau. The archipelago was formed from an ancient delta. Only some 20 islands are populated year-round. Lack of infrastructure and communication links prevent the development of the islands' unique tourism potential. Bubaque is one of the Bijagós Islands and is also the name of its main town. 13.6 km long and 8 km wide,the island has an airstrip and is linked by ferry to Bissau. The forested island is known for its wildlife. The archipelago was declared a UNESCO Biosphere Reserve in 1996—Boloma Bijagós Biosphere Reserve, known for animals including marine turtles, and hippopotamus. 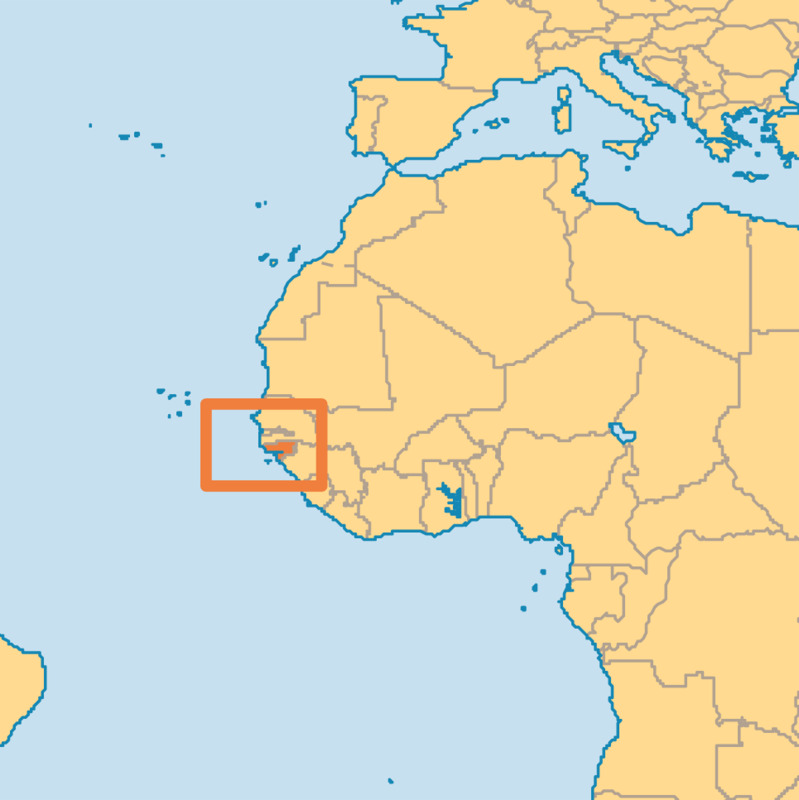 Guinea-Bissau has named the large Archipel Bolama-Bijagós as its second Ramsar Site. The inter-tidal mudflats host one of the largest populations of migratory shorebirds in the world. The influence of coastal upwelling and estuaries and the large areas of mangrove support large number of fish species. The site hosts the largest colony of green turtles. Sunspots are dark, irregularly shaped areas which can sometimes be observed on the surface of the sun. They appear dark because they are about 2000° C cooler than the surrounding sun's surface . Sunspots can be seen with the naked eye under favorable conditions and have been observed for thousands of years. Galileo was the first European that we know of to observe the sun using a telescope. He recorded observations of sunspots in the seventeenth century..
Sunspots often appear in pairs in which one is like the north pole of a magnet and the other like the south pole of a magnet. The two poles (sunspots) are linked by loops of magnetic field which arch through the sun's corona. 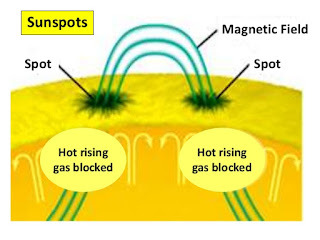 Their strong magnetic field inhibits convection of heat to the surface. Soon after the sunspot cycle was discovered, more than a century ago, a strong relationship was noted between the number of spots on the Sun and the number of auroras that were seen in the northern (and later the southern) skies. A similar relationship was soon established between the number of sunspots and the state of Earth's magnetic field: When the Sun showed more spots, Earth's magnetic field was more frequently disturbed by violent "magnetic storms." Sunspot activity goes up (from minimum to maximum) and down (from maximum to minimum) in an eleven year cycle. Communication systems on earth and satellites are affected by sunspot activity. In addition, it has been known for many years that the state of Earth's ionosphere - the ionized layer of the high atmosphere that makes possible long-distance radio communication - is affected very critically by solar activity, in step with the number of sunspots. It is not the spots themselves that bring about the terrestrial changes, but other, less frequent and more dynamic events such as solar flares and eruptions in the chromosphere and corona. Flares are sudden brightenings of limited regions of the chromosphere. By almost every measure they are thCalendar May 2017e Sun's most catastrophic and energetic events. They have special importance to man, for they are known to produce effects that race through millions of kilometres of inter-planetary space to rattle the upper atmosphere and magnetic field of Earth, altering the ionosphere and producing auroras and magnetic storms. Solar flares are now believed to result from the sudden conversion of magnetic energy to the energy of heat, light, and motion. 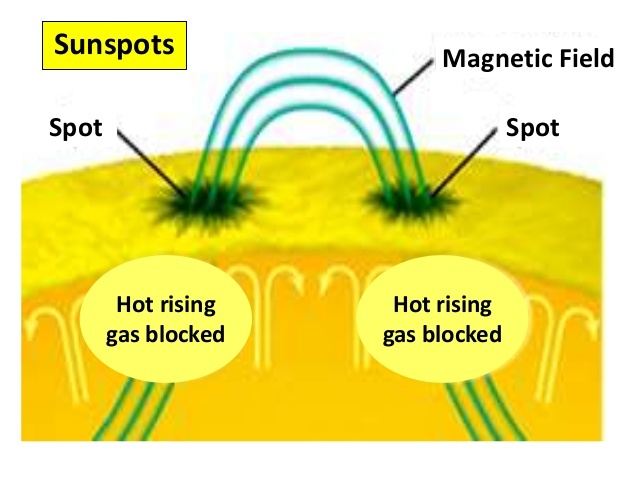 Flares have little effect on the sunspots themselves. Because sunspots are the most easily observed of all solar features, they have traditionally served as the storm warnings of the solar system. Astronauts such as IZØUDF Samantha Cristoforetti, are able to see sun-spots better than most of us. I am indebted to the Italian Radio Amateurs Union (U.R.I.) monthly magazine QTC which featured this famous YL. Even if you dont understand Italian, its worth looking at the pictures. (born April 26, 1977 in Milan, Italy) Samantha Cristoforetti is a European Space Agency (ESA) astronaut of Italian nationality. Between November 2014 and June 2015 she spent 199 days on board the International Space Station as a Flight Engineer for Expedition 42 and 43. During ASI's Futura Mission, Samantha conducted experiments in the Station's laboratories. Samantha is a Captain in the Italian Air Force. On 16 July 2015 she was awarded the Order of Merit of the Italian Republic, the highest ranking honour of the Republic. (ANSA) - Bolzano, January 3 - Italy's first female astronaut Samantha Cristoforetti gave birth to a daughter, Kelsey Amal in Cologne, Germany, at the end of November 2016. The 6th .YL round of the MAFC will take place on 6 May 2017, led by (OE3YTA Tina) with OE3XMC the club-call of the Mödlinger Amateurfunkclub at 17.30 LT, on 3740 Khz + - QRM. All YLs and OMs, also from other ADLs or clubs are also gladly included in the log. After the round, all the listeners are invited to the confirmation. Under the MAFC's (Moenlinger Amateurfunkclub) flag on the 5th of May, we are organizing an amateurs' presentation at the 'New Mittelschule Brunn am Gebirge' for the 4th time, and at the same time taking part in the European Day of Schools. We will start with a Power-point introductory presentation for about 100 students and teachers with OE1PYA, Peter. Afterwards, the kids can get in contact with other school stations on- air at a short wave station, managed by OE3YTA, Tina and OE4SLC, Sandra. We hope to make many QSOs via Repeaters operated by OE3VET Emil, OE4ENU Ewald and OE4NAU Norbert. 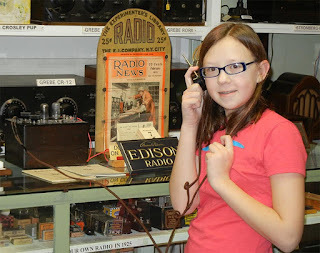 OE3OPA, Peter will demonstrate Morse-code to the pupils and OE3TDW, Thomas will show the young people emergency radio activities, and of course the kids - as with any presentation - can marvel at the great funkobil of OE3MSU, our Max. The ÖVSV / Landesverband OE3 - Niederösterreich as organizer - in cooperation with the ICOM - Radioclub, the disaster relief service of the Johanniter accident assistance / area communication, the ADL 350 and the ADL 303 (district of Mödling) hosted a special event for radio amateurs on 22 April 2017 at the atomic power station Zwentendorf. 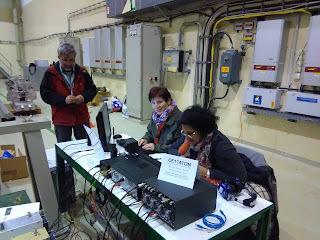 Information booth occupied by OE4SLC Sandra, OE4ENU Ewald, OE3CFC Chris and OE3YTA Tina.